Hey y'all! 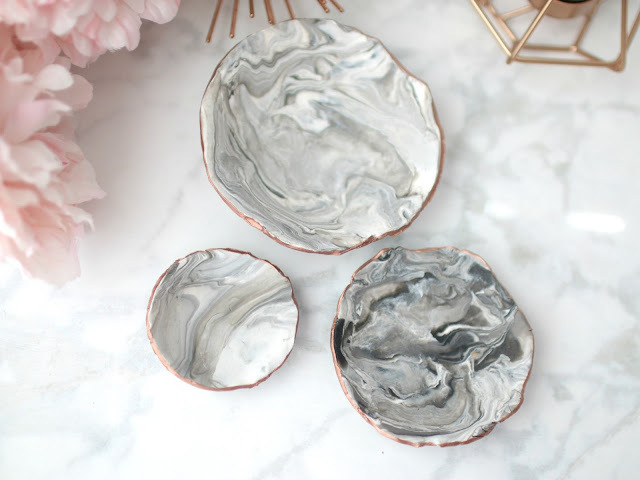 It's been a while since I've had a DIY on here, so I thought I'd share one that takes 5 minutes to make and would look great at home: diy faux marble coasters and bowls! Line up your clay colors. I broke the white into 4 pieces. I placed two white, one grey, one black, two white, and one grey next to each other. Then I twisted them together, like a snake, as pictured above. 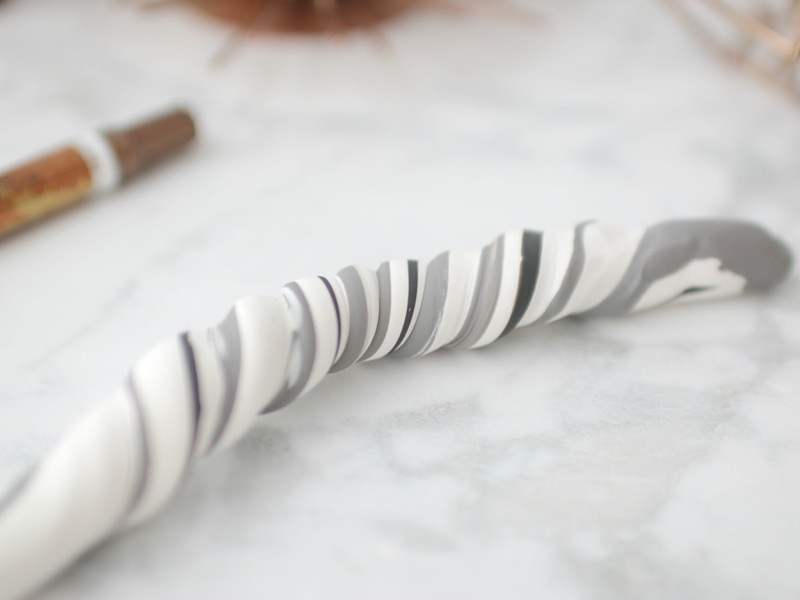 Keep twisting and rolling until you start to see a marble effect. The more you twist, the lighter the color of the marble will be. Roll out into a sort of circle shape. Try to keep it even on all sides. Place your pattern (I used a coaster, haha) on top of the rolled out clay and cut around it with a knife. Remove the excess and reuse it desired. Bake according to package directions. Once cooled, seal with Mod Podge. 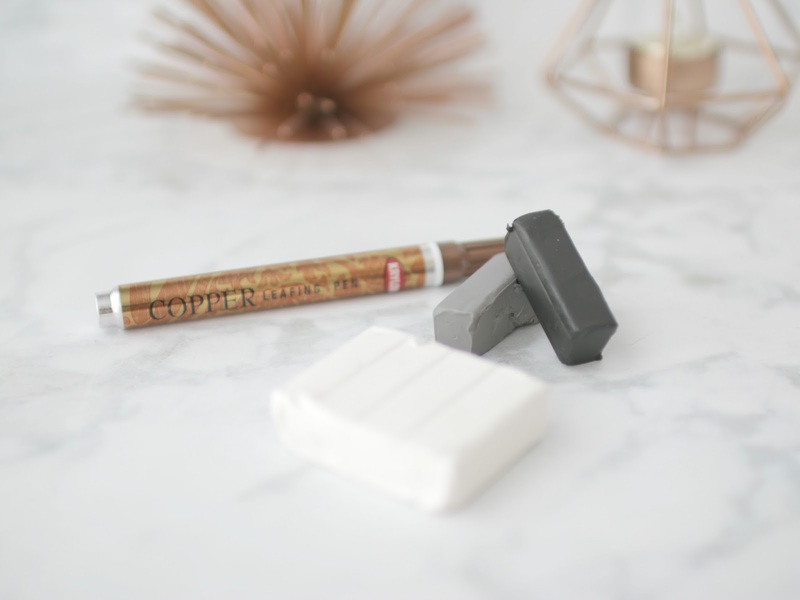 Add an extra touch to the edges with a metallic paint pen. I've also used nail polish for this too. 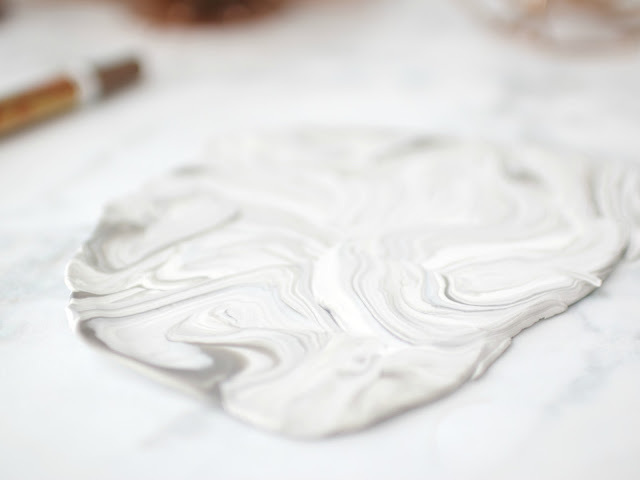 You can also paint onto the clay--like try half marble, half painted. I've made these lots of times for others so many different ways! Here's the finished piece! I was able to get two coasters from the amount of clay shown in the first pic. I used circles here for the demo since they are super easy, but I've made these in hexagons and squares, too. I've also made bowls. I simply followed the same steps (I used more grey and black) and traced around a bowl as my pattern. I placed the clay inside of the bowl (I have also placed the bowl upside down and the clay on top). Then I placed the oven-safe bowl and clay inside the oven and followed directions to bake. I wouldn't use these for food, but they make great decor pieces. I also didn't mind the rawness of the edges. 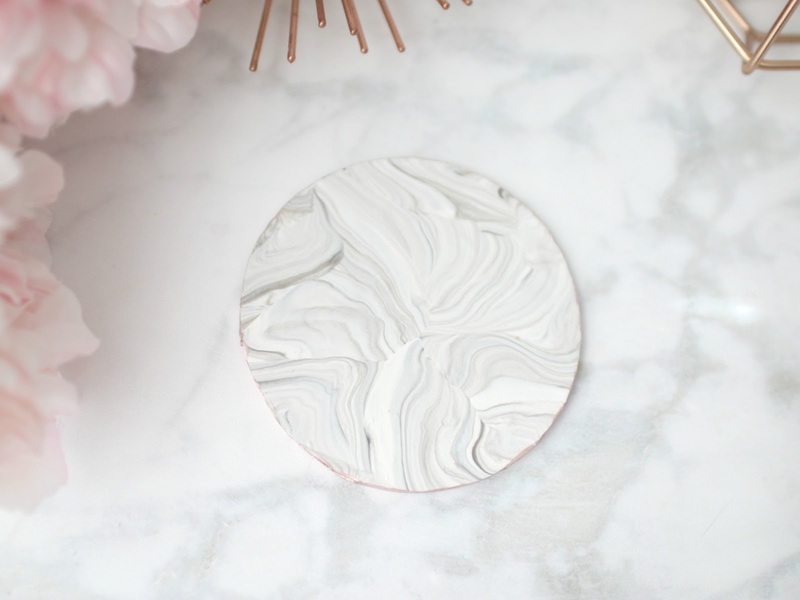 Are you a fan of marble? 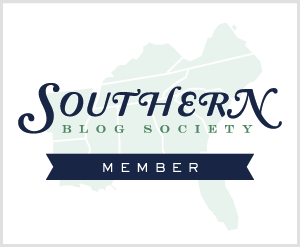 Still hanging in there--please be patient as I am slowly, slowly getting caught up on blogs and emails. I am feeling better! I made the marble tray that you showed awhile back and now I'm going to have to make these to go with it! Love how easy it is! They are so pretty! These are so cute Elle! You always have the most creative DIY projects! I love the look of marble, so these are fabulous! These are so pretty! I absolutely love how the bowls turned out with the raw edge! What a great DIY! These look so neat!!!! They turned out so well and look like something you spent a lot of money on! Very cool DIY, Elle:) Love both the coaster and the bowl! WHATTT??? I need to start playing with this. It looks fun! Is that clay easy to find? You are so creative, Elle! 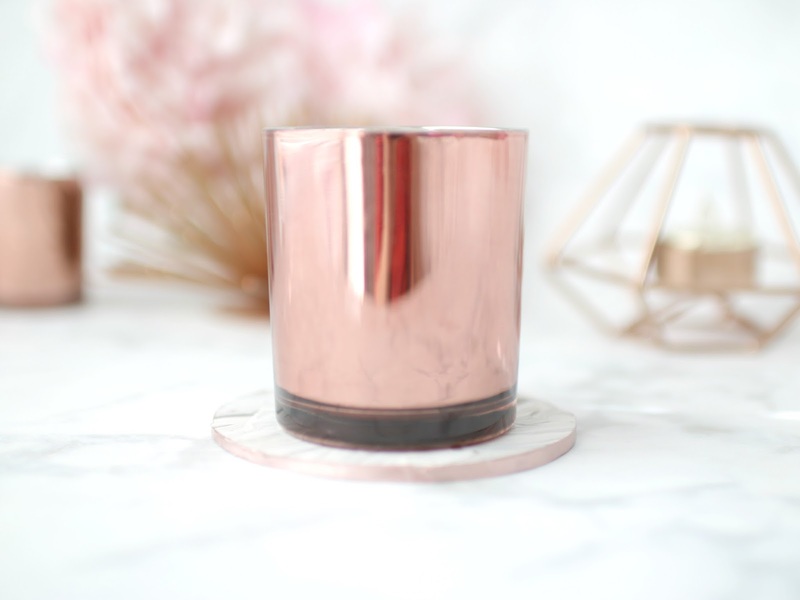 I literally have coasters that look exactly like the ones you made, but I love the copper accents on yours. It looks pretty easy, too. I might have to try to make these -- they would be perfect as a housewarming gift or for my mom with Mother's Day coming up. Thanks for sharing these and Happy Tuesday! This looks like such a fun DIY! I love the rose gold accent. You are so creative. Keep on getting well! I am crazy about marble so I am all about these precious little dishes! You are amazing and so so talented! So pretty! I am just not a DIY person though... I wish I was! Wow these look gorgeous! Thanks for sharing! Very nice diy! I really think I should try it myself! I love marble. What a great DIY. I love marble, but I think the only thing I have that is marble is a soap dispenser from Target. These turned out beautifully! I especially love the bowls; they are truly works of art and would be such a special gift. Thanks for sharing, Elle! You are so creative and talented! I love the look of these bowls! Gorgeous Elle. Thanks for sharing this awesome DIY. Well how cute did these turn out? You're so crafty, lady! 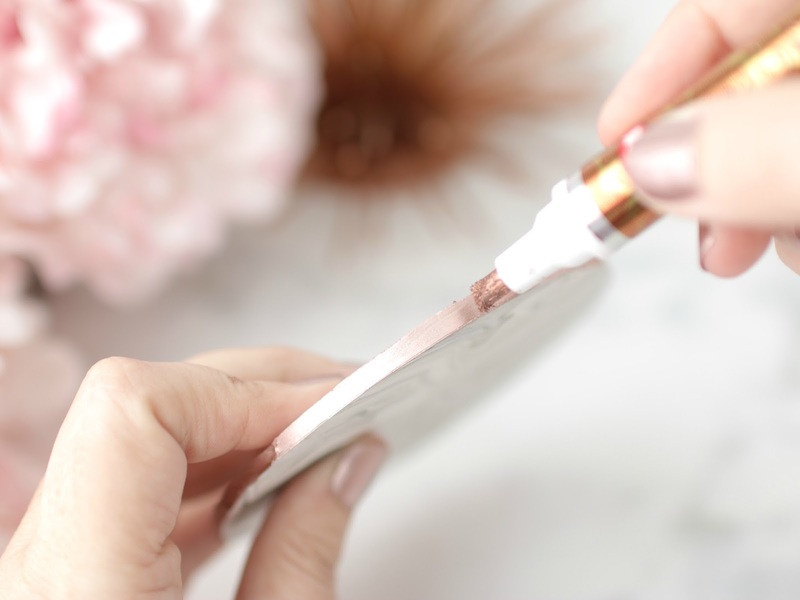 What a pretty DIY! I love it! Oh wow your talents never cease. These turned out great and look so professional. 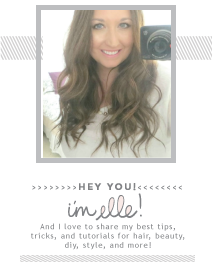 Elle I say this a lot, but I love your DIY's! You're so talented and creative. These marble items turned out beautiful! I'm adding this to my DIY list! I had no idea this was so simple! I love it!! These are so cute! I really love the way your bowls turned out! I have to admit that when the marble trend first came about, I wasn't a fan. But the more I see it, the more I love it! Especially house/kitchen marble things! p.s. I'm glad you are feeling better!! LOVE this idea! Those bowls and coasters are gorgeous! Omg these are so adorable and seem so easy! What a fun DIY! These are adorable and seem simple enough! Ooh these look awesome!! They look like something you would buy, for a lot of $$! I'm glad you're on the mend Elle, you take care of yourself! I need to try this, thanks for sharing!!! Ooh nice job! i love the swirled look and coasters are always good! I do like marble, Elle, and I found your coasters great! I loved the bowls as well, and you are right, for food they may not be good, but as decor pieces, they look great! These look amazing! Such a cool DIY! This is amazing! I was just thinking about a week ago how I don't have anything marble. Would love one of these as a trinket type tray. You are amazing - I'm totally heading to Michael's for clay! Wow those coasters and bowls look so amazing! You are really creative, I would never even have the idea to do that... I'm very tempted to do a few coasters now! Love the marble look! The coasters came out gorgeous! These look like something that would be at Urban Outfitters or Anthropolgie for $25+. These are so cute and I am obsessed with anything and everything marble! Ooh, love this and it looks so simple...! Will have to try this out!